If you are in the middle of a redesign or your floors are just simply outdated, you’ll need to choose new flooring. But, what are the best flooring options for your home? There are undoubtedly a few things you will need to consider before making a decision to protect your investment. 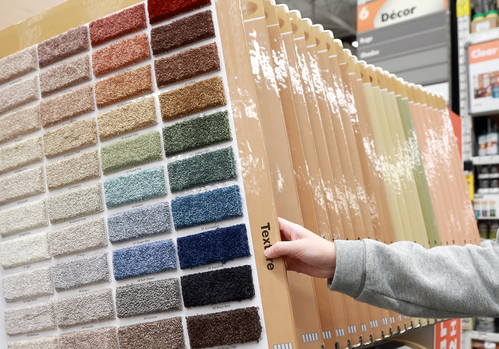 After all, you want the flooring that you choose to look great, last long, and suit all of your needs! Flooring Intention: What is the intention of your flooring? For example, if you need flooring that you know will get wet often, you may want to stay away from choosing hardwood flooring. Or, do you need new flooring in a high traffic area? You may wish to choose a material that is resistant to scratches. Each room of your house has a purpose, and the flooring in each room shouldn’t deter the room from providing its purpose. Home Needs: Obviously, one of the main concerns you should have when choosing new flooring is your own needs. Do you have pets? You may wish to choose flooring which will prevent scratches. Do you have small children? Consider softer carpets. Do you have allergies? You may wish to go with a flooring option that is easier to clean like wood or tile. Whatever your needs as a family or individual, consider these before you make your final choice. Upkeep: Different rooms of your home get dirty for various reasons. Make sure that the flooring that you choose for a room suits your maintenance schedule. For example, if you like to mop your kitchen floors to keep sanitary, choosing wood floors isn’t the best option because they do not do well with moisture. Keep in mind your cleaning style and needs before choosing the flooring in each room of your home. Aesthetics: Of course, you want the flooring to look great. Also, you want the flooring that you choose to look good with another flooring in the house. If you have carpet in the bedroom but you are redoing the area outside the room, choose a flooring option that looks good next to the carpet. Additionally, make sure that you choose a flooring option appropriate for spacing. For example, in a bathroom, carpet can hold bacteria and water unfit for safety. Although it was acceptable in houses 30 years ago, it’s just simply an eyesore to have carpet in a bathroom today. Instead, go with a flooring that pairs well with the rest of the home’s floors. Carpet: Great for bedrooms and child rooms, carpet provides both a soft look and touch. Different selections can provide you with texture, length, and color. But, carpet can be hard to maintain as it soaks up liquid and stains easily. Wood: Natural wood is arguably the most beautiful type of flooring option. But, it definitely has its drawbacks. Being of wood, naturally, it does not do well with liquid or any kind of moisture. So, maintenance is restricted to dusting and sweeping. Laminate: A great option to wood flooring, laminate doesn’t damage when cleaned with water. Also, it is a cheaper option that wood. Providing a number of colors and styles, this option is a beautiful one. The downside is that it may not last as long as real wood flooring or be as stunning. Tile: The most resilient of your flooring options, tile comes in many different styles, shapes, patterns, colors, and even materials. It is completely waterproof, so it’s best for areas like bathrooms and laundry rooms. But, grout and tile may show dirt quicker and be harder to clean than other flooring solutions. Selected from the Best Flooring Options? If you are looking to redo flooring, make the process easier and faster by hiring a floor removal service. Dustbusters can save you time and energy by removing you flooring in a single day with our dust-free system. This means that there is absolutely no clean up for you after we finish! If you are interested in seeing how we can remove your floors in a clean, fast, and healthy way, please visit our website or give us a call at 866-883-8783.